Salinity is a general term used to identify the impact or potential impact of salt in soil and water. Salt naturally exists in the environment however when it is exposed in high concentrations to sensitive environmental features, agricultural production or infrastructure, it can cause damage. Where Does Salinity Come From? Salt is naturally occurring chemical stored below ground where it has accumulated over millions of years from a variety of natural geological processes. The amount of salt held in storage within the soil and rock below ground varies from place to place depending on geological history. Without water, the salt would stay stored below ground and salinity would not be a problem. However, because salts dissolve in water, and water can flow below the ground surface as groundwater, it is usually groundwater, and the interaction of groundwater with the ground surface, that leads to salinity. When salts become dissolved in groundwater as groundwater moves though the ground, salt can become concentrated in the soil at or very near ground surface when the surface of groundwater, known as the watertable, is less than around 2 metres of ground surface. The concentration of salt occurs when the water is evaporated and the salt, which cannot be evaporated, are left. Groundwater watertables usually experience cycles between periods where levels subside and become deeper below ground than other times when the watertables rise, sometimes getting within 2 metres of ground surface. The cycles of watertables rising and subsiding, are usually related to the amount of water that makes its way to the groundwater (called groundwater recharge). The most common form of groundwater recharge is rainfall, that falls and seeps into the ground during low evapotranspiration months (late autumn, winter and early spring). When there is more rainfall than normal during those months, some water can seep into the ground and become groundwater. The watertable then rises as more water is added to it. If the landscape is wet as summer approaches and is maintained in a saturated state due to irrigation (or excessive rainfall), it is possible for groundwater recharge to occur, even over the summer months. When this occurs, watertables do not drop but remain static or even may rise slightly and be primed for further rises if a pattern of wet winters and widespread irrigation over summer seasons, continues. Conversely, during extended dry periods when evapotranspitation is greater than water availability, groundwater recharge ceases and watertables can drop, leading to a reduction in the threat of salinity. Not only can the amount of salt below ground vary from place to place, but the amount of groundwater and the way it interacts with ground surface also varies from place to place, therefore the effects of salinity across a landscape can vary from place to place. The process of salinity is totally natural and has existed for as long as there has been salt and water. Global expansion of human population and the alteration of the landscape for agriculture in particular, have resulted in a shift in the way surface water interacts with groundwater, in those parts where landscape modification has occurred. In some areas, irrigation has introduced more surface water to land that naturally would not have received any or much rainfall over the summer months, while in other areas the removal of native trees for crops has removed the ability of tree leaf canopies to capture and allow rainfall to evaporate before reaching the ground. The man-made alteration of the natural hydrologic cycle can alter the way aquifers are recharged with water from rainfall – in some areas it may allow watertables to decline, that is, to slowly subside away from the ground surface, in others, the watertable might be maintained at higher levels, closer to ground surface than it may otherwise have been under natural conditions. Therefore, man-made alterations to local hydrogeological cycles as the result of changing the landscape, can contribute to salinity becoming more problematic in those changed landscape areas than it otherwise would have been under natural conditions. The actions of humanity have not caused salinity, salinity has always been a part of the natural world, however human actions can shift, either subtly or dramatically, the cycle by which salinity can emerge in the landscape. What Are the Negative Impacts of Salinity? The impact of salinity on the natural and man-made environment is generally disruptive at best or destructive at worst. The growth of most plants, including most common horticultural or broad-acre plants and grasses is reliant on water taken in through their roots. Salt in water interferes with the osmotic process of plant roots, restricting plant’s ability to take in water. This restriction can lead to declines in vegetation health and vitality, similar to the effect of drought, and can ultimately lead to the death of plants. Agricultural yields are dependent on plant health to maximise financial returns to farmers and their farming community. Even small declines in yield across many farms that are experiencing effects from salinity by having salty water (the groundwater watertable) in close proximity to plant zoot zones, can have a cumulative impact on a local community or the wider rural community. In addition a sustained supply of fresh quality water, plant growth is also reliant on healthy, well-structured soil. The best soil for vegetation growth retains moisture around the plant’s root zone yet at the same time, is porous enough to allow water to drain downwards through the soil profile so plants roots do not become water-logged and rot. A well-structured soil has these properties. The very fine grained clay particles in soil can have their structure altered by salt. The positively charged sodium ion from a salt molecule can be adsorbed and replace a calcium, or other positively charged ion in a clay particle molecule. The exchange of the sodium ion to clay particles causes the shape of clay particles to shrink and changes that way clay molecules are attracted to each other. When this process occurs to many millions of clay particles, the soil which is made up of the affected clay, appears to compact when wet and the clay particles do not bid together when they are dry, so the soil turns to dust. When rewetted, the dust forms a compact and dense sheet. The overall effect is a loss of soil structure and the soil is now termed a “sodic” soil. Plants’ ability to extract water from soil affected in this way is much more difficult than from well-structured soils. The soil’s capacity to physically support vegetation is also reduced because the soil particles do not bid together well. Therefore, sodic soils, the result of salt interaction with clay particles in the soil, greatly affects plant growth and vitality and in the agricultural setting, losses in crop productivity can be the result. Plants and animals will generally thrive where conditions are favourable to their existence. Where conditions have few obstacles to life, a wide range of life forms will develop and communities with inter-reliant biological dependencies will emerge and exist in balance. From a biological perspective these, what can be called “biodiverse” communities, are important because a diversity of lifeforms provides the enhanced opportunity for evolution – a fundamental law of the natural world - through the mixing of genetic material. A diversity of life forms also bring about a web of life and a food chain which further enhances the ability of the biological community of sustain itself and survive. From an aesthetic perspective, a diversity of life also provides humans beings with the opportunity to experience the natural world and aspects of the wide variety of lifeforms other than ourselves. This is important to many people. As described in the paragraphs above, the effect of salinity on vegetation and the soil that supports vegetation, can form one such obstacle to life of plants or in some cases, animals. The more salt affected a particular area of land becomes, the greater the obstacle to living conditions for the plant species and the animals that are dependent on them in the salt affected area. As the more salt sensitive plant and animal species die off or migrate, the diversity of remaining species diminishes, until finally there may only be a few salt tolerant species dominating. The biodiversity of that area will have been lost, and to many people, the aesthetic beauty of the area will have also been lost. Most many made structures that are in contact with the ground, are constructed from a combination of elements such as metals, binding agents like concrete or mortar, and foundation of porous materials like wood, stone or brick. Salt is an electrolyte, a substance that is a good conductor of electrons. The rusting or corrosion process of metal, iron in particular is the result of electron transfer, therefore exposure of metals to salty water will speed the corrosion of those metals, more quickly than just exposure to water. Salty water is mildly acidic and as a mild acid, can break down concrete. Much concrete is also reinforced with steel rods. Salty water can corrode the steel rods inside reinforced concrete which weakens the overall strength of the concrete structure and secondly damages the concrete around the corroded rods which further weakens the structure. Salt is also hydroscopic, it can attract and hold water. Water held by salt in concrete, wood or brick can freeze. Frozen water expands, shattering the concrete, wood or brick. The fine grained nature of material like concrete, stone, brick allows water (including salty water) to be “sucked” upwards above ground level through a process known as “capillary rise” – the same process used by plants to lift water from their roots to their leaves. Salt damage can therefore occur above ground level and can often be seen around the footings of buildings at up to knee height above floor level or the pavement. Salt can therefore damage concrete in several ways and also damage other building materials. How Can Salinity Be Managed? The processes that give rise to salinity usually occur over large areas and over long time scales. Those processes cannot be controlled to any great significance through human intervention since the main driver for groundwater rise and fall is climate, and to a great extent (other than in tropical regions), the Australian climate is highly variable and unpredictable. At a local scale however, say at a farm scale, salinity can be managed if and when climatic conditions are such that regional watertables rise, approach ground surface and therefore pose a threat to the environment or land productivity. The method for managing salinity at a local scale with almost immediate effect, is through groundwater pumping. When groundwater is pumped from a borehole, the groundwater pressure in the aquifer around the borehole (or boreholes) is lowered. The pressure decrease becomes greater closer to the borehole – in unconfined aquifers (sometimes called watertable aquifers) the watertable is lowered by the drop in water pressure as shown below. 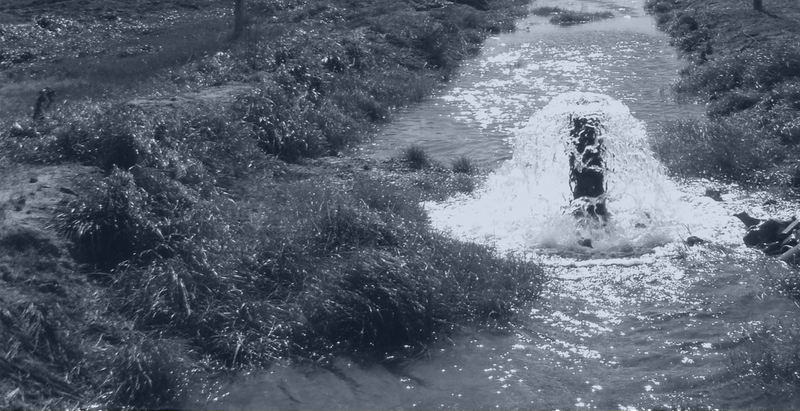 Groundwater pumping is therefore a quick and effective way to firstly lower groundwater levels over what can be sizeable areas and then maintain groundwater levels what otherwise may have been salinity affected productive land. Lowering watertables draws groundwater away from the root zone of plants, and it also provides a buffer to allow any salt that may have accumulated in the unsaturated zone (the soil above the watertable) to be flushed downwards and away from plant root zones by rainfall moving through the soil over the winter and early spring months. The Farm and Surface Drainage programs that have been underway in the Shepparton Irrigation Region for many years have promoted landscape modification both to reduce water ponding on-farm and improve water shedding from the catchment. These initiatives act to reduce the potential for surface water to seep into groundwater and raise watertables. Salinity can also be managed indirectly though improving, at a regional scale, water use efficiency by better aligning water use with plant water requirements, providing only the water than plants need without excess water bypassing the root zone and seeping into the groundwater. 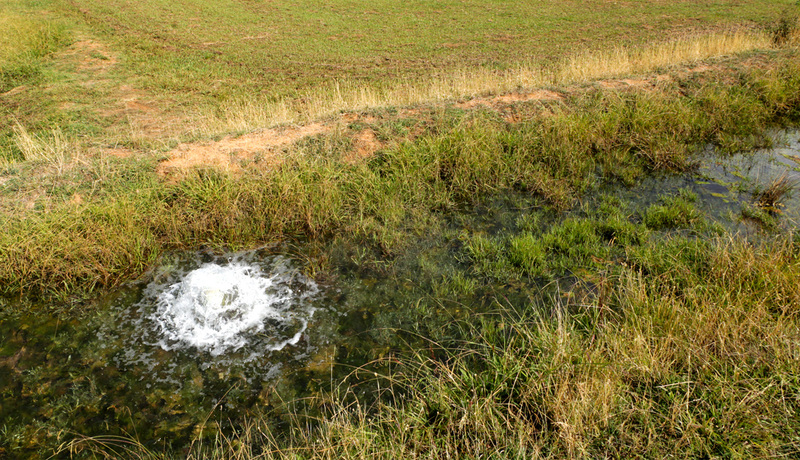 Other, passive forms of groundwater pumping are available to reduce watertables. Native vegetation, which are generally more salt tolerant than introduced crops, can act as natural groundwater pumps and reduce watertables at a local scale. Tile drains (a buried grid of drainage pipes installed below ground surface) are another way to intercept shallow watertables – however tile drainage is an expensive option for managing watertables and salinity. Plants can tolerate water containing salt, however the degree to which plants can do this depends on individual plant species. Therefore, before using salty groundwater to irrigate crops, farmers need to know the salinity of the groundwater and the salt tolerance of the particular crop the water is intended for. If groundwater is too salty to be applied directly to a particular crop, an option may be that surface water (say channel or dam water) is blended with groundwater to dilute the concentration of salt to acceptable levels before it is applied to the crop. If dilution is not possible, plants can be irrigated with salty water for short periods of time but farmers choosing to do so must be aware of the negative consequences to productivity and plant vitality and the potential damage to soil health. This being the case, the use of salty water should be an option of last resort and a plan needs to be developed and strictly implemented to allow plant and soil health recovery afterwards. Where salty water has been applied to land for a period to time to the point where the soil structure has been damaged (i.e. become sodic – see Water Are the Negative Impacts of Salinity?) and the ability of the land to support productive cropping or natural vegetation has been compromised, it is possible for the affected land to become rehabilitated. Recovery of salt affected land may take several years to become productive or support a diverse natural ecosystem and the duration of recovery time will depend on the severity of salinity impacts. However, it is possible for land, and associated dependant vegetation, to recover. The Shepparton Region has been the centre of irrigation in Victoria for over 100 years. Irrigation in the Shepparton Irrigation Region first began on the early 1900s and expanded at a slow but steady rate over the next half century. The region is part of a much larger irrigation network the Goulburn Murray Irrigation District (GMID), operated by Goulburn Murray Water that extends from Yarrawonga in the east and follows the Murray River downstream to Nyah. The Shepparton Irrigation Region consists of four sub-regions, the Murray Valley, Shepparton, Central Goulburn and Rochester irrigation areas. The early 1950s saw the beginning of a period of huge expansion in irrigation water storages, firstly with the raising of the dam wall at Lake Eildon on the Goulburn River, then the construction of Dartmouth Dam and Hume Dams on the Murray River. The dam building phase continued into the mid-1970s. The Shepparton, Central Goulburn and Rochester irrigation areas have their irrigation water sourced from the Goulburn River system, fed by Lake Eildon while The Murray Valley irrigation area is sourced from the Murray River system which has its main water storages: Lakes Dartmouth, Mulwala and Hume. These water storages provided huge increase in the capacity to capture water over autumn and winter in the alpine areas of Central Victoria and provide large volumes of water for irrigation and regional urban water supplies. The main crops are pasture for dairy production, horticulture for processed and fresh fruit production and viticulture (wine) which supplies a manufacturing sector producing around $1.7 billion of goods annually. Over a forty year period spanning the mid-1950s to the mid-1990s, the volume of water being supplied to farms annually across the Shepparton Irrigation Region increased three-fold from around 500 gigalitres in 1955 to around 1,500 gigalitres in 1995. Salt occurs naturally in the sediments of clay, silt and sand that exists across inland Australia, the result of millions of years of erosion of the dividing range, the accumulation of meteoric salt (salt in rainwater) and in parts, salt remaining in areas that were once under seawater. The Shepparton Irrigation Region is not an exception to this and salt in the sub-surface sediments can dissolve in groundwater and when groundwater nears ground surface, the salt can come into contact with plant roots and stress plant health, or precipitate on ground surface causing many plants to die, leaving only a few species of salt tolerant plants. If not managed salinity poses a significant threat to the agricultural output in areas where intensive cropping is undertaken, such as the Shepparton Irrigation Region. Groundwater in the Shepparton Irrigation Region is sourced from two main aquifer systems. The uppermost aquifer is called the Shepparton Formation which consists of sand and gravel layers surrounded by clay and silt. 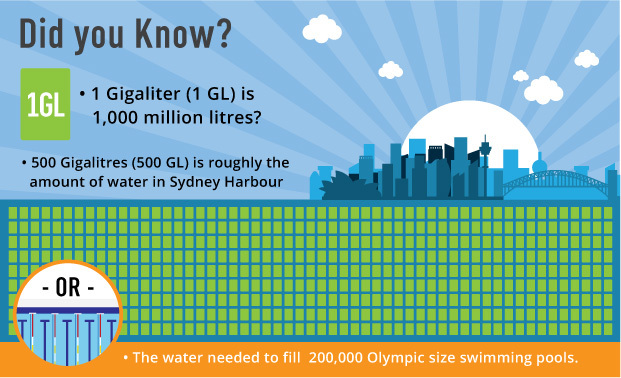 It is not one aquifer but a series of many aquifers that are generally considered as one. The sandy layers were deposited by creeks and rivers that meandered across northern Victoria millions of years ago. The layers are generally thin – only a few meters thick at most and can be found close to ground surface (within 15 meters). Individual pumping yields are generally less than 5 ML per day. In this region, the aquifers near ground surface are considered to make up to the watertable aquifer, therefore the watertable reflects groundwater levels from the aquifers in the upper portion of the Shepparton Formation. 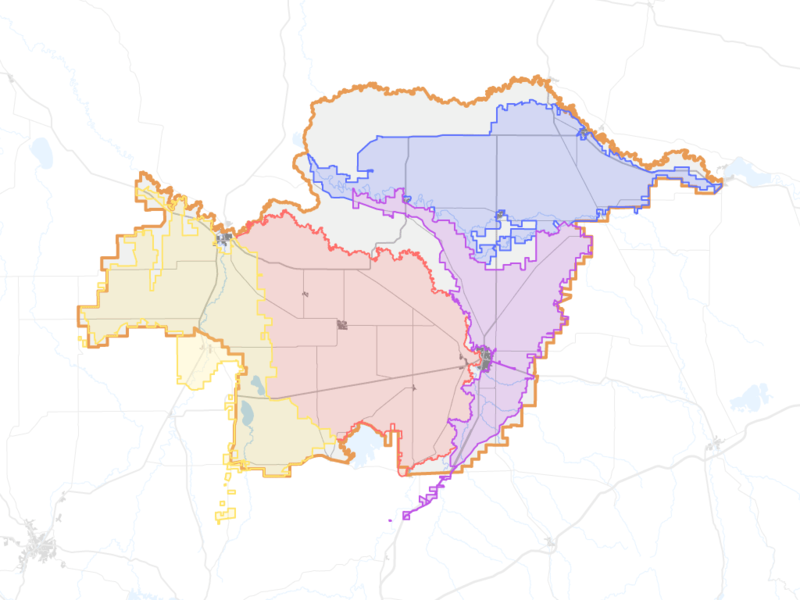 In parts of the Shepparton Irrigation Region, the Shepparton Formation is underlain by another major aquifer, called the Deep Lead aquifer or Calivil Formation. This sand and gravel aquifer can be both thick (tens of meters thick) and wide (many kilometres) and individual pumping yields can be in excess of 10 ML per day. The salinity concentration in the Deep Lead aquifer is generally less than in the Shepparton Formation. The Deep Lead is used for irrigation purposes in the Murray Valley and along parts of the Goulburn and Campase Rivers. The Deep Lead aquifers system is confined – that is, the clay of the overlying Shepparton Formation acts as a confining barrier. The groundwater in this system is pressurised. While the movement of groundwater between the Deep Lead and Shepparton Formation does occur, it is very slow (due to the clay of the Shepparton Formation) and generally downwards, from the Shepparton Formation aquifers to the Deep Lead. In the late 1970s, the watertable (the surface of the groundwater in the shallow aquifer system) across parts of the Shepparton Irrigation Region was observed from groundwater monitoring bores, to be gradually rising, and if unchecked would approach ground surface. The rise in the water table continued with each passing year and by the early 1980s there were parts of the region where the watertable was very shallow, within 2 metres of ground surface. The community awareness of salinity was also increasing at the same time and steps were initiated to combat salinity through the co-operation of the community and local agencies (Link to Mending the Goulburn Broken) to develop salinity management plans and changes in the way farms were laid out and used water, under the vision and long-term strategic direction of catchment management plans (Link to Goulburn Broken Regional Catchment Strategy). This phase of intensive planning and undertaking salinity management work occurred throughout the late 1980, the 1990 and into the early 2000s. Many millions of dollars were invested across the region in public and private works (namely groundwater pumps, surface drainage networks and on-farm laser grading of irrigated land). Then between 2000 and 2010, the region, like much of south-east Australia was impacted by a succession of below average rainfall years – the Millennium Drought. During that period, winter and spring water inflows to the major irrigation storages remained low and a succession of irrigation seasons resulted whereby irrigators where provided with only a fraction of their irrigation allowances. This forced communities, local resource management agencies and governments to focus on projects resulting in water use reduction and efficiency. The Millennium Drought broke in 2010 followed by another year of high rainfall in 2011. In both years, irrigation water use across the region was low due to abundant rainfall. This opportunity of low irrigation deliveries and high rainfall provided important data into how regional watertables behaved in response to prevailing conditions. A review of watertable data in terms of irrigation and rainfall, has shown that rainfall pattern has a greater impact on watertable levels than the pattern of irrigation water use. The pattern of rainfall across the region can be seen in the chart below. The chart shows the cumulative change in rainfall from the long term average, from 1881 – 2014, based on annual rainfall data from three Bureau of Meteorology climate stations across the Shepparton Irrigation Region. The chart shows that between 1900 and 1950, the Shepparton Irrigation Region generally experienced average or below average rainfall resulting in an cumulative deficit of around 580mm below the long term average of the 50 years. Conversely, chart shows that between 1950 and 2000, the Shepparton Irrigation Region generally experienced average or above average rainfall, with several periods of significant high rainfall years (floods) resulting in an cumulative increase of around 1300mm above the long term average of the latter 50 years of last century. Importantly, it was during the latter “wet” half of the century, that irrigation use in the region increased tripled and water storages increased massively. There was therefore abundant surface water available through a combination of rainfall and irrigation at a time when water use was increasing dramatically – it is likely that the water use was a consequence of the water availability – and up until the mid 1990s, the situation appeared to be the norm for many people whose memories did not extend back to pre-1950 farming days. Over the approximate 10-year period of the Millennium Drought, the Shepparton Irrigation Region experienced a cumulative rainfall deficit from the long term average of around 800 mm. By 2009, irrigation water use had declined to levels similar to the early 1950s as the result of storages holding low levels of water. The watertable across the region declined and became gradually deeper (as the chart from one groundwater monitoring bore below shows – the blue line is watertable depth, the green line is the rainfall pattern: the residual mass rainfall). With the decline of the watertable, the threat posed to agricultural production across the region from shallow watertable salinity also declined, with the areas under threat becoming smaller each year until by 2010, there was almost no areas with watertables within 2 metres of ground surface. In 2010 and 2011, the region experienced consecutive above average rainfall years wet years with a total of around 600 mm falling, above the long term average rainfall for those two years. The result was low irrigation use due to abundant rain, but also a rapid rise in watertable levels, with rises of up to 2 meters from the lows of 2009 measured. The watertable behaviour observed across the region in response to the drought and the subsequent wet years, followed by a return to near “normal” irrigation (the new “normal” irrigation use volumes are now in the order of 1,000 gigalites per annum) and rainfall over 2012 and 2013, has altered the pre-drought understanding into the nature of the regional salinity threat in response to prevailing surface water conditions from one of “fixed and unchanging” to one of “highly variable and driven by climate”. This being the case, future salinity threat management has to adapt between conditions of low intensity management during periods when it is dry and watertables are at depth, and high intensity management when watertables rise and approach ground surface following wet rainfall years. The threat will be variable in terms of time of occurrence, duration of occurrence and the areas where the threat is realised. An adaptive salinity management system is the approach that has been adopted across the region, replacing the former ridged approach which was both highly prescriptive and management intensive. The animated graphic below shows the Shepparton Irrigation Region shallow watertable pattern at the end of indicated time intervals with plots (to the right) of water availability from rainfall and irrigation compared to long-term averages over the same intervals. A key premise for the adaptive salinity management approach for the region is that of providing informing to landholders that will allow them to make their own assessment of salinity threats to their farming enterprise based on latest information and provide them with access to information to take management action in accordance with the threat priority they perceive. This website has been developed to provide that information.